Imagine a luscious roasted Thanksgiving turkey served right in the center of the table, in the confines of a beautifully decked and chic restaurant, with a dinner service which is par excellence. Make this 2016 Thanksgiving special, and head for Thanksgiving dinner with your entire family to a Thanksgiving-hosting restaurant. In New York City, you will find a myriad of dining options where you can enjoy the festive feast. Celebrate the holiday at the best Thanksgiving-hosting restaurants in NYC and have a great time with your loved ones. Are you wondering where to eat Thanksgiving dinner in NYC? Keep reading to find out some of the best restaurants in NYC that will be open to make your 2016 Thanksgiving special. Where to Eat 2016 Thanksgiving Dinner in NYC? Eleven Madison Park: Price: $245.00 with optional $135.00 wine pairing, chef Daniel Humm and partner, Will Guidara, are set to serve a stylish festive meal. The restaurant offers a four-course menu with several options available for each course. Union Square Cafe: Price: $125.00, kids $55.00, the Thanksgiving dinner is a perfect occasion for chowing down on chef Carmen Quagliata’s bistro meals. You will find a four-course of fall-forward classics, with family-style sides. Dovetail: Price: $138 (vegetarian menu $125) with optional $75 wine pairing, enjoy Chef John Fraser’s culinary delights and indulge in the kitchen’s inventive uses of luxurious ingredients such as foie gras, beef cheek, and trumpet mushrooms. You can opt for the three-course prix fixe menu as well. Maialino: Price: $155.00 for both menus, kids $65.00, head to restaurateur, Danny Meyer’s Italian restaurant and enjoy an Italian-infused cuisine. You can choose from two four-course Thanksgiving menus: an Italian-American, turkey-focused meal and an Italian option, centered on a whole roasted suckling pig. Craft: Price: $150.00, enjoy the three-course, family-style menu, which lets diners choose their own adventure by selecting a locally raised protein, and a number of elegant vegetable and grain sides. The Breslin: Price: $75.00 with optional $45.00 wine pairing, Indulge in Chef April Bloomfield’s classic pub and indulge in some steaks, roasts, and terrines. The Polo Bar: Price: A la carte, Head to fashion mogul, Ralph Lauren’s gold-trimmed restaurant, and look out for the classic American menu and your holiday favorites. The John Dory Oyster Bar: Price: A la carte, head to this restaurant, which will open up its oyster bar and will serve signature dishes which will include its chorizo-stuffed squid and seasonal cocktails. Le Coq Rico: Price: $85.00, enjoy your duck and turkey this Thanksgiving at this restaurant. Enjoy the four-course menu which includes duck foie gras with cranberry chutney, followed by turkey consomme with shiitake mushrooms and more. Sant Ambroeus West Village – Popular Italian cafe will be open on Thanksgiving from 7:30 a.m. until 9.00 p.m.
Gotham Bar and Grill – $145 for four courses with reservations available between 12:00 p.m. and 9:00 p.m.
La Pecora Bianca – Offering a four-course, Italian-inspired Thanksgiving meal at $70.00 per person. 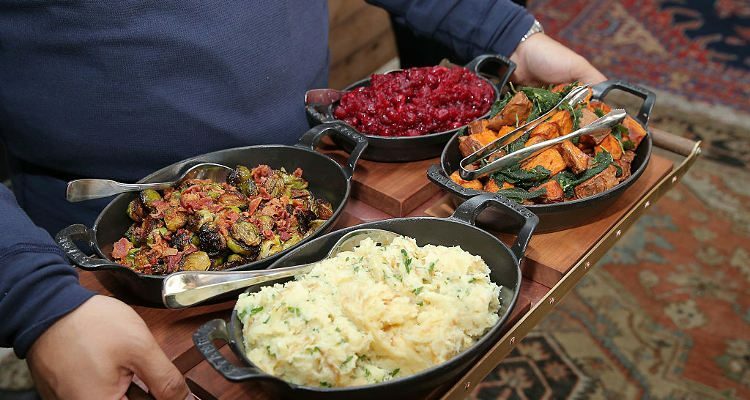 The NoMad Restaurant – Offering a $145.00 prix fixe on Thanksgiving with family-style sides. db Bistro Moderne – The menu at Daniel Boulud’s Midtown bistro is $75.00 perr person starting at noon. Indian Accent – Chef Manish Mehrotra is serving a multi-course prix fixe menu at $95.00 per person, and will be open from 2:00 p.m. until 8:00 p.m.
RedFarm – Both the Hudson and Broadway locations will be open Thanksgiving Day starting at 3:00 p.m.
Glasserie – Serving a special, non-turkey Thanksgiving feast at $68.00 per person and is open from 4:00 p.m. until 9:30 p.m.
French Louie – The restaurant is offering a $75.00 three-course menu. Prime Meats – Serving a three-course Thanksgiving prix fixe menu at $57.00 and available starting at 12:00 p.m. Celebrate 2016 Thanksgiving and head to the restaurant of your choice for a scrumptious Thanksgiving dinner. Diez, P., “Where to Eat on Thanksgiving Day in New York City,” Eater New York web site, November 10, 2016; http://ny.eater.com/maps/best-thanksgiving-restaurants-nyc.